Having grown up in a popular tourist destination, it’s not surprising that a lot of people have visited my home town so I thought I’d put together a list of things you’ll know if you’re from York. 1. Everyone assumes you spend your weekends in Betty's tea rooms. I must admit, I have been several times but over the course of 24 years, though I’m not sure it makes me a regular. 2. People ask you about flooding. Not surprisingly, as York has had some pretty terrible floods which have been devastating for those affected, but it is always a question you get asked. 3. If you’re local to York, you judge the floods based on whether or not The Lowther is open. If it is, it can’t be that bad, right? For those reading this who aren’t from York, The Lowther is a pub that’s down on the river front and when it floods, they put boards down for people to get in over the water and they still open upstairs. 4. The city smells like chocolate when the wind blows in the right direction. I used to run past the Nestle factory with all of its chocolatey deliciousness being pumped into the air. It was devastating. 5. Every time you walk down The Shambles, you’re guaranteed to hear ‘oh wow, this is like Diagon Alley’. 6. The Ghost Walk is terrifying. It could be because the last time I did it, I was about 7 and was so scared I nearly fainted (LOL), but I must admit it’s not one for me. 7. Going out on the weekend of a race meet is a massive no unless you’ve actually been at the races. There is zero fun in being around 8 hours of drinking behind every other person in town. Also, with every man and his bros in suits, there’s a definite bridesmaid effect going on. 8. When you see people visiting York and taking beautiful photos of themselves in the Museum Gardens, you giggle a bit as you remember how you spent your teenage years there taking dodgy selfies without a forward facing camera. 9. You’re used to seeing Vikings knocking about town and feel a bit sorry for them getting stopped by tourists. They’re just Jorvik Centre employees on their lunch break! 10. If you’ve been around York long enough, you’ll remember the yellow man who was there before the purple man. 11. Growing up going on nights out in York divides women between those who can absolutely nail walking down cobbled streets in heels and those who simply wear flats because it’s safer. 12. When you’re in town and it’s sunny and there isn’t as much scaffolding around it as usual, you still take the classic Instagram shot of York Minster just to show everyone that your home town has the most impressive cathedral in the country. York is the best. Don't you agree? 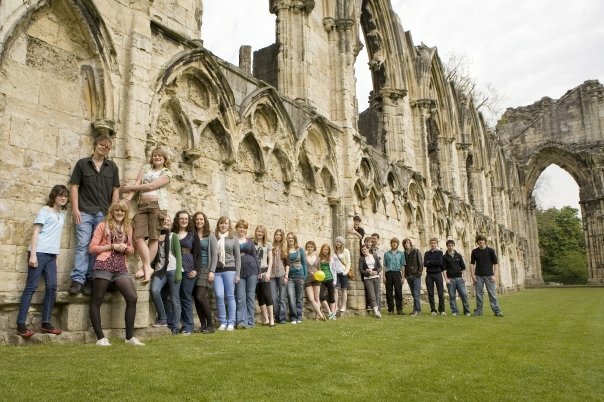 been to York many times, as I used to live not too far away, and loved it! kinda want to visit again now!! Great post. Love York! My home forever.